Illustrations note 1 Illustrations, black and white; XIII, 253 p. 1 illus. Chapter 1. Introduction; Ros Stuart-Buttle & John Shortt.- PART I. Framing the Discourse.- Chapter 2. The Naming of Parts: Faith, Formation, Development and Education; Jeff Astley.- Chapter 3. Is Talk of `Christian Education' Meaningful? ; John Shortt.- Chapter 4. The Christian University and an Anthropology for Adulthood; Mario D'Souza.- Chapter 5. The Faith-full Intellect: Catholic Traditions and Instincts about the Human Person and their Significance for Teaching and Learning; Clare Watkins.- Chapter 6. Deeply Christian, Healthily Plural: A Vision for Schooling; David F. Ford.- Chapter 7. Living Tradition and Learning Agency: Interpreting the `Score' and Personal Rendition; John Sullivan.- Chapter 8. 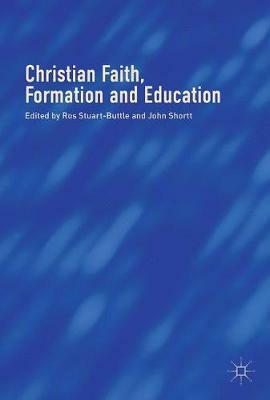 Formation and Christian Education in England; Trevor Cooling.- Chapter 9. Theological Education and Professional Practice; Ros Stuart-Buttle.- PART II Reflections on Practice.- Chapter 10. Journeys of Faith: Personal Stories, `Multi-logue' Narrative and Faith Formation in Schools; Andy Wolfe.- Chapter 11. A Sense of Belonging: Spiritual Development in Christian-Ethos Secondary Schools; Ann Casson.- Chapter 12. Religious Education - Where to from here? Reflections on the Trajectory of Australian Catholic School Religious Education 1965-2017; Graham Rossiter.- Chapter 13. `We Need to Keep the Door Open': A Framework for Better Understanding the Formation of Younger Teachers in Catholic Schools; Richard Rymarz.- Chapter 14. Interpreting Texts More Wisely: A Review of Research and the Case for Change in English Religious Education; Robert A. Bowie.- Chapter 15. Christian Leadership in Education; David Cracknell.